July 26, 2014 | by Darcy Blake | What’s going on at the Veterans Memorial Senior Center in Redwood City? Parkinson’s exercise classes! Gone are the days when there weren’t many specialized exercise programs for this movement-disorder. Due to the work of Dr. Becky Farley’s Parkinson Wellness Recovery (PWR!) and her comprehensive Exercise4Change approach, and other targeted exercise programs in the forefront; we are beginning to have the luxury of choice when it comes to exercise for Parkinson’s Disease. In an effort to help others form exercise networks, Arizona-based Dr. Farley and Dr. Claire McLean of Hoag Hospital in Newport Beach trained 94 therapists and instructors in the Bay Area for four days in the spring of 2014. PWR! exercise (individual or group) is based on four key movements that underlie everyday movement: your ability to power up (get up against gravity), twist, step and rock. 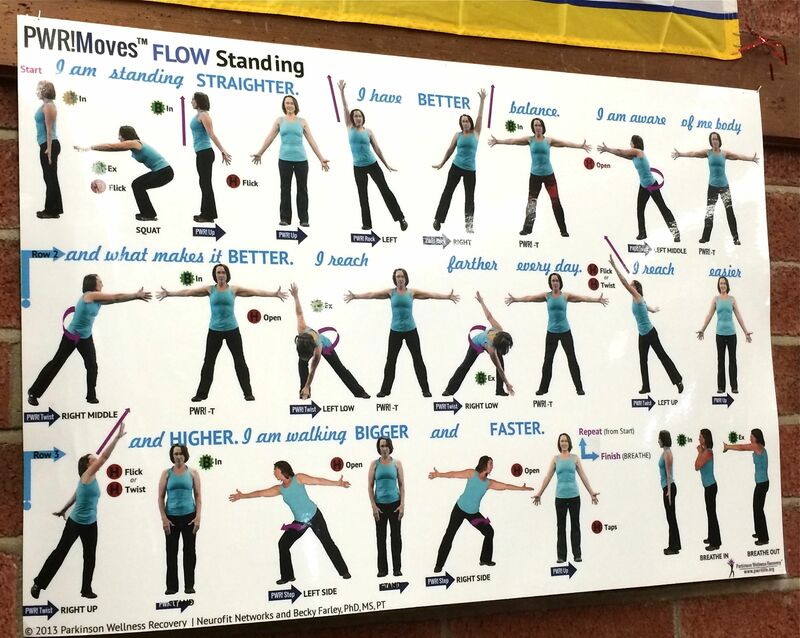 If you can stay engaged, while you do these exercises, integrating these large amplitude movements in all that you do, you can target PD-specific symptoms such as rigidity, bradykinesia, lack of coordination and balance, cognitive/attention deficits, and emotional imbalance. The Veterans Memorial Senior Center in Redwood City offers three classes that are based on PWR!Moves™. One class is an intermediate level and two are for advanced levels. Two are PWR!Moves™ Group classes, meaning that they are movement-based, whereas one is a PWR!Moves™ Circuit Class that includes performing these four key movements using gym equipment to increase the physical and cognitive challenge. Location: Adaptive P.E. Room, Veterans Senior Center. Level: This is a lower level class than the classes on Wednesday or Thursday. Contact: Please contact Katie before registering: Katie kparafi@gmail.com or call (650) 299-4717. Location: Redwood Room of the Veteran’s Memorial Senior Center. Level: This is a high level class consists of 60 minutes of walking, balancing, and aerobic activity. Contact: Please contact John before registering: johnberdoulay@sbcglobal.net or call (650) 393-9073. Time: A new weekly class starts Wednesday August 6, 4:00-5:00 p.m. Location: Adaptive PE room of the Veteran’s Memorial Senior Center. Level: This class is designed to improve the functionality and fitness of people with Parkinson’s. The class focus is based on Dr. Becky Farley’s PWR!Moves™ technique designed to improve the strength, coordination and mobility for people living with Parkinson’s. How can I get certified in PWR? I have taught Yoga for 9 years. I have MS and this year was diagnosed with PD. Darcy suggested I answer you about the PWR! Instructor Certification course. We will begin offering certification courses at our local PWR!Gym in Tucson AZ November 7-8-9, 2014. We anticipate having at least 6-8 courses in Tucson in 2015. Stay tuned on our website as they will all be posted by September 1 and we will be ready for registration. We also offer PWR! Therapist workshops around the US and CA specializing in the development of comprehensive 1:1 neuroplasticity-principled treatment plans.